Does the string lights waterproof or durable? The string lights built with high waterproof level. Made of high quality rubber material, features weatherproof heavy-duty and flexible. Different from other string lights on the market, our string light's connector is fully wrapped to withstand all kinds of weather. Enjoy your parties with your friends in the backyard with such an affordable product. 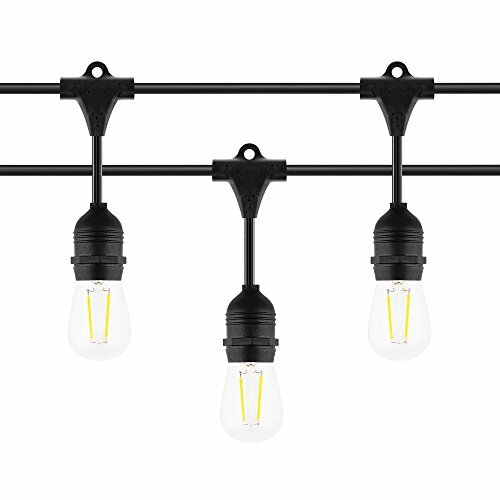 [Great for lighting festive interiors and exteriors] Our Heavy Duty Commercial Grade String Lights are sure to add flair to all your special events in Patios, Backyard, Decks, porches, terrace, gazebo, walkways, bistro, party, cafe, restaurants, awnings, and wedding tents, indoor and outdoor malls. [Commercial quality at a residential price] UL listed 48 feet black weatherproof cord with 15 fully sealed and self-gasket E26 light sockets. Durable waterproof and heat resistance materials are intended to protect the strand from extreme hot or cold temperatures, rainy, windy, humid climates and so on. Compare to those cheaper holiday lights and you'll feel the difference. [Ideal Outdoor Illumination] 18 pack of 120V 2W S14 E26 bulbs for 15 sockets and includes 3 extra bulbs. Our 2 Watt LED bulbs are compatible with any plug-in dimmer to enhance the atmosphere of a romantic evening. You can easily change the amount of light to create the perfect ambiance for anytime of the evening. Noted Dimmer not included. If you have any questions about this product by Bktech, contact us by completing and submitting the form below. If you are looking for a specif part number, please include it with your message.